Reducing your spending. Cutting your expenses. Finding ways to save. Paying down debt. Increasing your income. Optimizing your investments. 99% of people probably have better hobbies than trying to find every way to save more money. I admit that I’m one of those weird people in the 1% who actually enjoy this. But I also recognize that most people absolutely do not. And I don’t blame them. Honestly, I’ve started to realize that I enjoy the planning and projecting side of budgeting much more than actually making the sacrifices to stick to the budget. Make your own budget using our favorite method–zero based budgeting! I once tried to quit drinking coffee so that I could save $10-15 a month. That lasted all but 3 days. Today I want to share with you the secret to my budgeting success. It’s less of a tool or trick, but more of a framework that will help you make budgeting decisions– a way to approach budgeting that will get you the most results with a little less effort. I truly believe that this will help you make some major budgeting wins. And maybe… Just maybe… you may find that some of the pain you experience with budgeting will go away. This framework is all about making the right budget decisions and handling your finances the smart way. 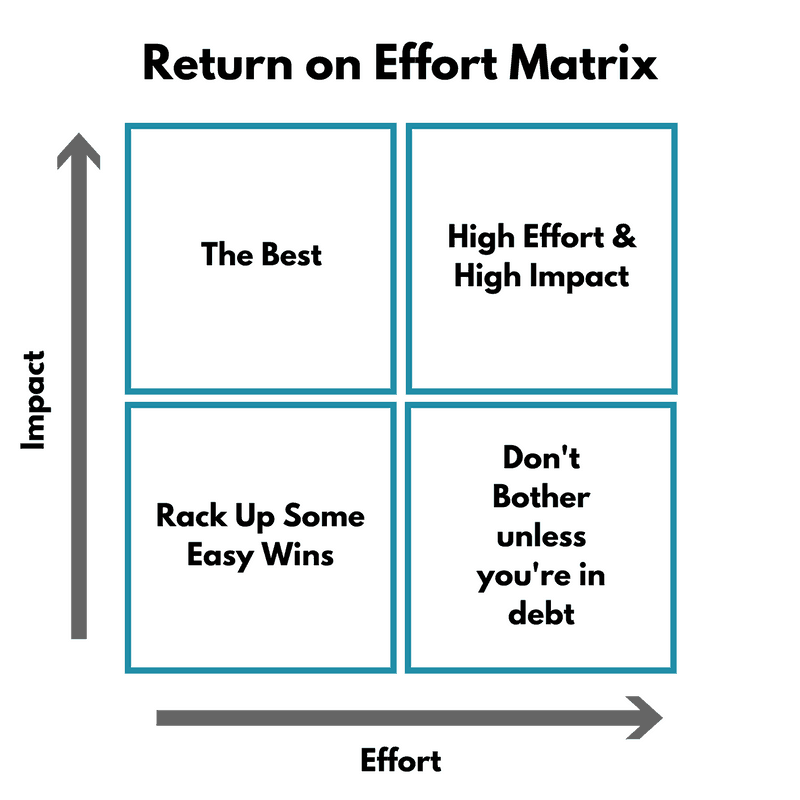 This return on effort matrix is simple. There are hundreds of ways that you can reduce your monthly/yearly expenses. If you want to budget smarter, then you just need to make decisions that will get you more bang for your buck. It should go without saying that this is a highly subjective chart. Everyone is in a different situation, had different preferences, and has a different “tolerance level” for pain. Things that are easy for one person to go without might be incredibly difficult for someone else. I know people who can’t imagine taking the time to find recipes, go to the grocery store, cook a recipe, and eat it throughout the week. For me, I love cooking and my wife and I actually go on grocery shopping dates. The biggest consideration in this whole framework is your income. If you are making $100,000 a year, then paying $9 a month for Netflix and buying coffee a couple times a week from a local coffee shop won’t break the bank. In order for the effort to be worth it for higher income earners, either the impact will need to be higher or the effort they put in would be less. Don’t get me wrong. People who live on a higher income should still avoid letting their lifestyle creep up with their income. They can afford a few more small luxuries than the rest of us. But at the end of the day we should all fight lifestyle inflation. This is obviously the sweet spot. Doing less work and getting more results! Wouldn’t it be nice if every budget cut we made was easy and had a huge impact on our ability to save more money? If you want to save money without really trying then you definitely need to max out these easy wins. I’d also be willing to say that if you aren’t willing to put in the effort for these easy changes, then you don’t really care about saving money. These are one-time changes that can kick back savings month after month. They usually either require you to cancel a recurring expense completely or to find a way to lower them. A great way to save a few extra bucks every month is to negotiate all of your current bills. It may surprise you, but nearly every bill you pay can be lowered. If you don’t want to do this yourself, get the experts at Billcutterz to do it for you. It is completely free to sign up! They negotiate your bills for you so that you can save as much money as possible. The only catch is that they split the savings with you 50/50. The great part is, they only make money IF they are able to save you money. You’ve got nothing to lose. There’s no question that saving small amounts of money every day can add up quickly, especially on daily habits and expenses. Cut your own hair and save $25 every 4-6 weeks. I want to share two more changes that can make a huge long-term impact on your ability to save that don’t take much effort up front. Move your investments into a fund with a lower expense ratio and save $400,000. Check out our guide on this! Put your emergency fund into a higher interest earning bank like Ally and earn 125x as much as most major banks. Another great easy win is using cashback apps like ibotta, ebates, and swagbucks! I’ve written a super thorough ibotta review that will help you save money on groceries and other shopping! Sticking to a budget isn’t always easy, but it should at least be worth it. This quadrant is where you really have the ability to save some serious money, but it won’t be easy. It may require a sacrifice in your lifestyle or some week to week discipline. These tend to focus on the three major areas of spending: Housing, Transportation, and Food. Limit your spending in these 3 categories and you will be on the fast track to whatever your financial goals are. The budget cuts that fall into this category obviously won’t save you a ton of money, but fortunately, they can be easy life adjustments that don’t take much effort on your part. These have a pretty low return on effort, but hopefully you can find some that you can weave into your life without thinking about it. Slow down your driving. Driving over 65mph increases your gas usage by 15%. Use Amazon’s Subscribe and Save function to save a little bit of money on your regular spending. This will save you anywhere from 5-20% as well as time, gas money, and stress. Avoid buying bottled water and instead use a refillable bottle. When you eat out at restaurants, find places with discounts that apply to you! This is great for teachers, veterans, students, kids, elderly, and first responders. Sometimes the time and effort required to save a couple bucks just isn’t worth it. This is obviously the least optimal of the 4 quadrants. If you spend a lot of time trying to save money on things that barely reduce your expenses, you might be better off going for a walk or getting some extra sleep. I wouldn’t even bother with things that fall into this category unless you are in serious debt or actually enjoy it and see it as a hobby! Buying cheap beer. It just isn’t worth it. Making your own yogurt and cheese. I read a blog post a few weeks back detailing one lady’s process to make her own yogurt. It was tedious to read and I can’t even imagine spending hours trying to save 10-15 cents a serving. I’d rather take a nap. Planting your own garden. 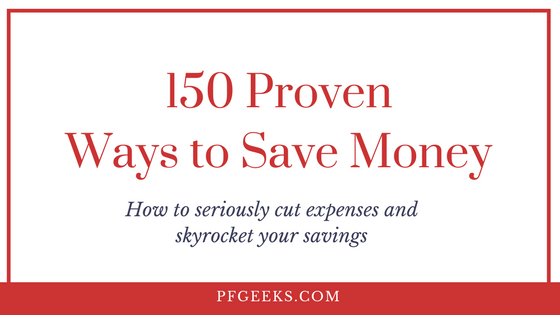 This might catch me some flak, but unless you are serious about it, you probably won’t actually save much money. If you enjoy gardening, then treat it as a fun hobby! At the end of the day, budgeting is not easy and it might be painful. But if you want to be able to save for retirement, buy a house, or pay off your debt then you have to do it. You’re going to have to put in the effort, but hopefully you can now maximize the impact your decisions will have. Focus on the activities and budget cuts that are the main drivers for financial success and that will get you the most return on effort. This was very clever. The tips will definitely take discipline as long as we are looking at the bigger picture and staying focused. Love this information. Pinned it! Thanks Anissa! Glad you found it useful. Like the matrix. So simple, but effective with budget decisions. Thanks Jumpstart! Glad you enjoyed it.